There have been 12 or so weeks of student protests here in Quebec. The government plans to increase tuition by around 75% over five years. The new tuition will still be very low, around $3,000, but the students are quite upset. If that makes little sense to you, let’s just say that cultural expectations are very different from the US or the rest of Canada. The protests have turned occasionally violent of late, and students have been staging night marches for the past two weeks. Riot cops follow them around everywhere, and sometimes break up the marches with force. I finally got to see my first protest. I live on a very quiet street, where nothing ever happens, so it was quite a contrast. I’d say about 1,000-2,000 students marched by, trailed by about 100 cops on foot and in cars. Memory card got full, but nothing happened in between. The protestors left, and the cops followed for a bit then turned back. There was one minor incident when someone threw something big and plastic at a cop on a bicycle. But no one on either side was interested in escalating. Despite noticeable tension, nothing came of it. For thirty days, I’ve had no home internet connection. I had no internet on my phone, either. I only connected in cafés. I’ve decided to reconnect. You may be thinking “of course!”, but there were actually quite a few pros to not having a connection. Under different conditions, I would stay without internet. I went to Cuba with no internet for a month, to write. I was much more productive and had more free time as a result. But, I finished my writing project on that trip. Turned out I was trying to solve last year’s problem, this year. My writing project required no research. So, any time on the internet was, by definition, time not working. If I were doing that again, I would cut off internet without hesitation. But right now, more of my work involves the internet. There were more points of friction. There was also a societal effect I didn’t count on. In Cuba, I had set up a situation where I didn’t need the internet at all. It was a slow month in Montreal, so I could afford to be away. I didn’t need the internet for any day to day administration while I was there. And everything is done offline in that Cuba, so I wasn’t breaking any norms. But back in Canada, there are many little things that require the internet. Paying bills, posting to a timesheet, finding tax guides for my tax return, and a million other little things that you don’t think about until you try doing them without a home connection. Paul Miller wrote yesterday that he is leaving the internet for a year. He’s doing more than I did – he won’t be using it in cafés or anywhere. I suspect the largest impact for him will be the surprise of all these little points of friction. It’s getting harder to do things offline. The non-internet infrastructure still exists, but it’s fading. I don’t want to give the wrong impression. I enjoyed my month of being disconnected at home. I felt different. Meditation became much easier. All the books I have around me starting getting read – I read more in this month than in four months while connected. Using the internet itself became more interesting. It was quite social being in a cafe whenever I was connected. I was forced to be more focussed. The amount of tea in my cup provided a natural limit for how long I could use the internet at one time. And I was able to avoid many of the problems I worried about. Blog post drafts went to Scrivener – I’m actually keeping this system. For random google questions, I just wrote them down on a piece of paper and dealt with them all at once. I realized that I should probably never be on the internet on my iPhone. It’s smaller and slower than my computer. But it’s very easy to just pick it up and read it, rather than a book. So I’m going to try and implement a hard rule of going to my laptop if I want to read anything online. When I’m not on the computer and I want to read, it will be a book. This is much easier to say than to do, but it’s the one change that’s most meaningful to me. That criticism is 100% correct. I lack the will power to use the internet exactly as I would like. But don’t think I’m more distractable than most people. I’m far from alone in seeing some danger in limitless connection. Paul Graham has written about the internet as a time-sink. There’s Paul Miller’s experiment above, and this experiment from writer James Sturn. And I got the idea to cut the connection from a Hacker News Post that appeared a week before mine. A writer went from 2,000 to 10,000 words per day when wrote without the internet. If you’re a writer, you should seriously consider disconnecting, at least on a trial basis. Since the internet is so new, we haven’t had a chance to think through how to use it. The internet is good. I like the internet, and so do most people. But we shouldn’t just use it unquestioningly. Like any technology, we must think about how to use it. If that’s not an issue for you, great. You can enjoy the wonders of limitless information without wasting time. But if you’ve ever felt the same way as me, then take a long, hard look at how you want to use the internet. I don’t think you can get away with not using it, or even not having it at home. But you can surely use it better. And if you can swing it, a 2-4 week disconnection will act as a good reset. You’ll see which parts you need, and which just waste your time. I’m Graeme. I’m a self-employed LSAT instructor in Montreal. Enjoy this post? Signup for my RSS feed or follow me on twitter. I took Udacity’s seven week intro to CS course when they launched it in February. It was a great intro to programming and Python. I’m now taking Web Applications Engineering with Steve Huffman, co-founder of Reddit. Steve is a great teacher, and the fact that Udacity has him teaching a class is a key part of their potential. Steve just has to make the course once. If everything goes well, they can run it forever. Steve can go back to working on Hipmunk, and continue to teach thousands of students with his videos. The assignment told us what to do (“make a web form that applies the ROT13 cipher to some text”), but not how to do it. I know, I know. It’s very simple, and completely pointless. But it’s the first “app”? I ever put on the internet, and the fact that it works makes me unduly happy. How to write a ROT13 algorithm. I’m sure mine could be better (here’s the code), but it works. How to create a new class to handle the POST and GET requests to my rot13 page. How take the user’s data, error check it, and return the rot13’ed text. Write the html to display everything. None of that is particularly useful, yet. There is a lot to learn to become a good programmer. But that list is a lot more than I knew how to do ten weeks ago, and I haven’t been doing this full time. And I’ll repeat, the page only took me ten minutes to make. When the class is done, I may actually be able to make a rudimentary app that does do something useful. Meanwhile, I’ll try to keep the sense of satisfaction and wonder I get from seeing my simple rot13 cipher work on the internet. I like Udacity’s project based focus. In this class, we’re building a blog. You learn so much more by actually doing it yourself. When something breaks, I have to figure out where I messed up. If I’m missing a component, I go read about it on forums or on the internet. You get very quick feedback with the quizes and homework. Quizzes ask you to apply the material you just learned to confirm understanding. Usually the structure is “Youtube video –> short quiz on video”. Homework assignments present larger problems, to make sure you can put everything together on your own. The homework is graded but doesn’t count towards the final mark. Only the exam counts for the certificate. This is a great time for online education. Khan Academy continues to be an incredible resource for all subject, math especially. MITX, Coursera all launched around the same time. Coursera has the most courses and MITX has the advantage of the MIT brand. Udacity offers one thing that none of these competitors do: a starting point for beginners. Both Coursera and MITX are (currently) aimed at those who already have technical knowledge. And so on. Anyone who finishes the 200 level courses can take the 300 level courses, and probably some of the Coursera courses aimed at more advanced students. We’ll have learned enough to make work on our own projects, and do research when we get stuck. Not everyone who tries Udacity will come out a programmer. But now many more people have the opportunity to learn. Last week I posted about my new experiment, living without an internet connection. I took all of five minutes to write it, and edited it once. Just for fun, I decided to submit it to Hacker News. It was my first submission. It hit the front page. Oops, wasn’t expecting that. This made for interesting results. Before submitting the post, I was the only visitor to my site. So I can attribute every visit to that post from the fact that it hit high up on Hacker News. Here are the results, plus a few lessons. 12804 uniques. The first wave came from Hacker News itself: 5736 in total. Yes, that’s less than half. Many visitors came to the site directly. 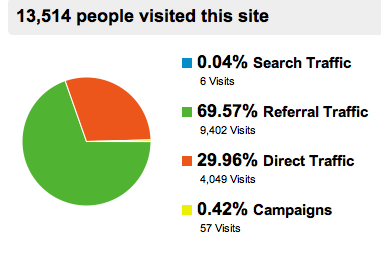 I’m assuming much of this was email, and the amount was rather large: 3,986 visits. That’s nearly as much as Hacker News itself sent, and almost four times as many visits as came from twitter. Email is far from dead. The engagement statistics were very interesting. 4:52 average time on page, and a 92.79% bounce rate. The bounce rate is to be expected – most people just read the article and left. But they really did read the article. Five minutes is an eternity on the internet. The flat line before April 6 is 0-1 visitors (i.e. me). 1. Be Ready For Luck: Until proven otherwise, I’m going to assume that luck was +90% of the reason my post hit the front page. I can’t count on that happening again. On average, people tend to get the same amount of lucky breaks. But some people are much better at grabbing hold of them. Lucks favours those prepared for it. Was I ready? By and large, no. I hadn’t set up simple things such as an an RSS feed link, or a link to let people follow me on twitter. You don’t usually get things you don’t ask for. I somehow still got 13 RSS followers, but I’m sure I passed up a chance to get many more. On the plus side, I had installed a caching plug-in for WordPress. As far as I know, my site didn’t crash under the traffic load. Phew. I spent all of five minutes writing the post. It would have taken only five more minutes to include social media links and edit it properly. It’s worth taking the effort to do things right. 2. Some Things Are More Attainable Than You Realize: I did not expect to hit the front page of Hacker News. In fact, I had assumed I couldn’t do it, for some amorphous reason that I never defined. I don’t know what I thought: maybe to hit the front page you have to be a startup founder, or VC, or a major tech blogger, or “insert reason X”. Nope. No special qualifications required. Just write a reasonably well-written post that’s of interest to the community. That’s obviously not a sufficient condition for reaching the front page, but I wasn’t missing any necessary conditions either. Don’t set up false barriers to tell yourself that you can’t do something. Some things are a lot more achievable than you think. I’m Graeme. I’m a self-employed LSAT instructor in Montreal, and I write about how to do things well. I moved into a new apartment at the start of April, and decided to try an experiment: not having an internet connection. When I tell people that I don’t have internet, they assume that it’s because I just moved in, and haven’t set it up. Nope, don’t want it. Is it because I can’t afford it? Nope, don’t want it. At this point, people become a little confused. Why would I not want an internet connection? Anytime everyone believes the same thing without question, there’s a good chance it’s something that we as a society haven’t thought through. This can be a good idea for things that have stood the test of time. But if something is new, we can’t afford to accept or reject an idea without question. The internet snuck up on us. It’s extremely useful, but we haven’t thought through how we should use it. It’s gotten steadily more enticing…there’s so much more you can do and read. If you want, you can spend your whole day on the internet. And that’s a problem. I think it’s a bigger problem than most people are willing to admit: many people have become internet addicts. I was one. Here’s my story. I’m 26, and have used the internet in a typical way for someone my age. I’ve been online since 1998 or so, and have always had a home internet connection since then. Since about 2008, I’ve also had internet on an iphone. My habits were similar too, I think. I would check email several times a day, I had several sites I often looked at (Hacker News, most recently), and I would often sit down to look up one thing and get up half an hour later, having browsed 15 different ideas. My first break from this routine came in 2007-2008, when I worked in Cuba for 7 months. Cuba has pretty poor access to the internet. By that point, I had been connected for about eight years, and constant access had become the new normal. I suddenly found myself with a lot of time on my hands. It was very, very different. I read War and Peace in a week. In fact, I read about 40 books while I was in Cuba. Real books, long novels. Crime and Punishment, The Brothers Karamazov…I swear they weren’t all Russian. I have not read that many books in the same time period since. I also watched several full TV series. The Wire, Dexter, My Name is Earl. I watched a lot of movies. And I had plenty of time to explore the country, meet new people, and learn Spanish. Basically, the internet had been sucking up >30% of my leisure time. I barely missed it (I still had some access at work), and my quality of life improved. I did not learn my lesson though. I went back to connectivity once I returned to the West, and continued to waste large amounts of time with aimless browsing. Last year, I decided to repeat the experiment. I was writing a large number of LSAT explanations. They’re profitable but boring and I wanted to get them done as soon as possible. If I was on the internet, clearly I was not writing explanations. So I went to Cuba again, for a month. The results? I wrote 50% more than I usually would in the same time period! I finished the Pimsleur German lessons I was working on. I met up with many old Cuban friends, explored Havana again, relaxed on the beach, and generally had more leisure time than I usually do. It was incredible. Mind you, I had someone cooking my meals and doing the dishes, so that helped too. But even accounting for that I got an astounding amount of things done compared to the norm. But when I came back from Cuba, I went back to my regular habits. I had an internet connection at my apartment, which I shared with roommates. But this month, I moved out on my own. I realized that, not having roommates, I didn’t have to get an internet connection if I didn’t want to. So, I didn’t. It’s been a week, and I feel great. I’ve gotten more done, read several short books, and moved into my apartment quickly and easily. For internet access, I go once per day to a nice local cafe that’s two minutes from my house. No Skype. Or, no Skype without talking in a noisy cafe. Can’t use Webapps at home. This means I can’t, for example, make a screencast with Screenr. I haven’t noticed other downsides so far. I paid about $65 for internet, so a $2 tea or coffee each day is actually breaking even. I can still do online courses such as Udacity during the time I’m at the cafe. And there are offline equivalents for most webapps. Encryption (for secure banking): Witopia. Blog posts: I made a file in scrivener to hold all my draft posts. I put them online when they’re ready. Email/inbox search: I downloaded all my messages to the OS X mail app. It has a better search than gmail(!) so I can instantly find any info I need. If needed, I can write a message using Mail; it will send when I connect. I usually just wait. Important Emails: I have about 5 email contacts who might mail me something both important and urgent. I set up gmail to forward any emails from those addresses to my phone. If anything major comes up, I’ll see it and be able to respond. Hasn’t happened yet. I can’t think of anything else that I’ve had to do differently. The increase in mental clarity is astounding. The real reason that this works is that the internet allows you to fill little gaps in your day. Have five minutes? Look at your phone. Passing by your desk? Why not see if anyone emailed you, or check what’s new on Hacker News/Reddit/newspaper website etc. Those small bits of web surfing add up to a surprising amount of time each day. If you don’t think this is true, try installing Rescuetime and let it count how often you’re in a browser window. You might be surprised. Remember to include time spent on your phone. You can try methods to “limit” your access, but then you’re drawing down your limited supplies of willpower. Whereas if the internet is simply not there, you have no choice but to do something else. Most Internet Service Providers will let you suspend your account for a month. Why not give it a try. If it’s terrible, you can always go back. But you might be surprised by the results. Note: I’m self-employed, and work from home. Not sure how the calculus changes if you’re an employee, I think it depends on your specific work situation. Update: This made the front page of Hacker News. Definitely didn’t expect this much attention. There were some good comments; I want to respond to a few points. Self-Control: Some people said I lack self-discipline. They’re 100% correct – I have a hard time resisting the urge to browse if access is easy. Some people do not have a problem with this; good for them. Everyone has self-control issues with something. Many people have trouble with the internet, which is why this post struck a chord. In my case, removing the internet from my house freed up my willpower from having to worry about it. I’ve noticed I have more self-control with other things now – studies have shown we only have a limited amount of willpower. Technophobe? : Far from it. Most of my work is done on the computer, and I still spend about two hours per day on internet work. It’s just more focussed. Update: I went back to a home internet connection. I wrote a post about it, but the short story is that I was taking a couple of online courses, and the connection speed at cafes made it cumbersome. I now do more internet work, which makes it difficult to disconnect. I’m the moderator of Reddit’s LSAT forum, and I’m in the middle of creating a site of free LSAT explanations. I need the internet for work, and yet I know the advantages of not having it, especially if I’m writing books. I disconnect my ethernet cable when I don’t need the internet. It’s enough effort to get up and plug it in that I usually don’t. This also prevents me from mindlessly surfing on my phone in bed, because the cable is unplugged. I would easily pay $200 a month for fast internet service that was only available 2 hours a day, or where I had to call the ISP to turn it on for a two hour period. That service doesn’t exist, yet…. It’s been a month and a half since I started learning programming. It’s going well, I’m halfway through “The C programming language”. I’m on chapter five, “pointers”, which is supposed to be the hardest part of C. It’s actually not so bad. I’m lucky in that I’ve found two good resources to help me along. I don’t actually know who Summit is, but he provides a very nice gloss on K & R. It’s invaluable to read over his notes after finishing a section. They help confirm me in my understanding of key points, or help me figure out any part where I’m stuck. This book provides official solutions to each exercise in K & R.
1. If I got an exercise right, I can see how my solution compares to the expert solution. 2. If I’m completely stuck, and have tried for a while, I can get an answer. I hope to finish K & R in 3-4 weeks, and move on to SICP. I’ve always liked computers, yet somehow I’ve never learned any programming. I never needed it for anything, and no one I knew ever talked about learning about it. So it wasn’t on my radar. But at the start of 2010, I left law school, and stared a website about the LSAT. I sell explanations online. I had to learn a bit about websites and freelance work. Along the way, I stumbled upon a site called Hacker News. It’s run by an early stage startup investment group called Y Combinator. The site has a surprisingly high level of discussion, and great information about programming. While working on my site, I could imagine all sorts of things that I’d like to do. And reading Hacker News made me realise that with the right knowledge, I could do those things. I’ve always liked learning new skills, and I have no trouble learning on my own. So I decided that in 2012 I would teach myself to program. Hey, that’a me! A bright person with no programming knowledge. The answer comes from Joel Spolsky, a prolific programming blogger. His team recently made a cool project management webapp called Trello. I use it to keep track of long range to-do lists. Check it out! Joel’s idea is to get a strong foundation. For a long time, before reading that post, I was stuck on which programming language to choose. But reading that post (and subsequent research) led me to realize that once you learn programming, you can learn a new language fairly quickly. It’s the mental concepts behind the abstract idea of programming that are the hard part. I looked into the books, and they seem like a good way to get that foundation. I’m currently (January 2012) on the C Programming Language. But I’m also using some other books. This blog is going to be a diary of sorts, so below I will describe each book I’m using. Hopefully it will be useful for anyone else who wants to learn programming. This is an excellent introduction to the idea of a computer. Petzhold starts from simple circuits, and eventually builds a whole working computer. Petzhold teaches you to understand and apply binary logic, using simple logic gates. He builds these up into a larger computer. It starts off easy, and gets harder. Make sure to actually work your way through the diagrams. It’s slower, but it’s the only way to really understand what’s going on. 1. A litmus test. I loved the book. And most people who program love the book (check the amazon reviews). If you don’t like the material, that could be a strong sign that programming is not your thing. Better to find out early. 2. The book gave me a clearer understand of what exactly is going on within the computer when it’s running my code. I plan to read the book again to solidify my understanding. This is not strictly a programming book, though it briefly introduces the topic. Rather, it’s an easy to read and information survey of the whole world of computing. This book gave me a good idea of how everything fits together, and which topics I should be aware of. Almost any programming tutorial starts with teaching you to build a simple programs that displays: “Hello, World”. Where did that idea come from? This book. This book is famous for teaching good style and for it’s clear, concise style. It was written by Brian Kernighan (author of D for Digital, above) and Dennis Ritchie, who created C and Unix. As of January 2012, I’m on the second chapter. The tutorial chapter took about three weeks, but that’s because I made sure I understood all the exercises. That chapter alone has taught me more than all the web programming tutorials I’ve tried, combined. You start right away with if-else statements, while and for loops, etc. So I’ve already learned a fair number of things to transform thoughts into a functional program. As a supplement, I highly recommend The C Answer Book. That book has (good) answer for each exercise. There were times when I was quite stuck. The biggest risk of working alone is succumbing to frustration while stuck on a problem. This book prevents that by offering a way out. I try to use it as little as possible of course, until I have a working solution. But even if I do solve an exercise on my own, it’s quite useful to look at another sample of code that achieves the same goal. You then learn what an atom is by seeing several examples. The book teaches you basic lisp concepts using the same method, such as car (first part of a list) and cdr (the rest of a list). I’m on chapter seven out of ten; the book has been a consistently fun read. I can actually feel it changing the way I think. My advice is to do answer the questions using pen and paper; no computer required. (The book only has value if you do answer the questions). Sounds pretty compelling to me. There’s a third book in the series, the Reasoned Schemer. I may get it, since these books are highly useful and don’t take very long to go through. But it covers something else, logic programming. For years, this was the textbook for the introductory computer science course at MIT. It’s legendary among skilled programmers. It’s not going to be easy, but I should be able to get through it – it was intended for undergrads, after all. I don’t have much to say about it, because I’m doing it last started it. But it promises to be excellent. There are video lectures available to accompany the course. In Canada, it cost me about $250-300 to buy these books. I think it will be well worth it. I’ll be posting updates about how the learning is going. Meanwhile, having all of the books on hand is a big motivator not to abandon the project. I started learning German using Pimsleur. It’s an audio course you do using an ipod, for half an hour each day. I got my roommate excited about the program, and so we decided to learn German together. He’s a musician, and will find the language useful for his craft. I just wanted an excuse to learn a new language. The program teaches you to be conversational. You’re taught a few words, along with excellent prononciation. Then the program asks you to say things to another person. It doesn’t tell you what to repeat. It asks how to say things in the target language. You have to remember, and sometimes improvise. It lets you practice saying things out loud, the same way you would in a normal conversation. I’ve used it before, for Italian. After 3 months, I could have conversations during my trip to Italy. It gives you everything you need to know to improve rapidly. And you sound nice enough that people enjoy speaking with you. Italians thought I had been learning for years. The best part is that you can do it whenever you have a half hour of chores. I do it while cooking lunch, and cleaning. I always felt that half hour was wasted. Now I get to learn a language instead. I can’t love this enough. I’m now using it to do all of my email. It switches from one message to the next instantly, so you don’t have to go back to the inbox in between. 2. Archive, Delete or Reply. I find I go twice as fast. It’s especially useful for just checking email a few times a day. Then there will be a few messages, and the gains are multiplied. I finally got around to registering my own domain. I couldn’t get graemeblake.com, but I think this will do nicely. Many inanities to follow. And the occasional useful tip.